CELEBRATING 20 YEARS OF THE BEST BRANDS. Try on in our store. Redback USBOK Steel Toe Cap Safety Work Boots. From the famous Redback elastic sided'Safety Bobcat' series, the USBOK in'Oiled-Kip' Claret, offers all the features of the world famous Redback'All Terrain' UBOK, but with the added advantages of Steel Toe Cap Safety. The USBOK has the same comfort features as the other boots in the'Bobcat and Safety Bobcat' series. This is the same style boot as the USBBA but with a different finish. The Redback USBOK features include. Improved lightweight, two-component Urethane Air cellular midsole with millions of tiny air bubbles to improve shock absorption, energy return and weight reduction. All leather 3 piece upper. Full-length foot bed and arch support. 3 layer reinforced heel for comfort and support. 180mm elastic sided ankle boot. New Cross-Linked Compression Moulded Translucent Outsole, giving high density weather, lubricant and fuel resistance and improved performance in temperature extremes. Multi-directional cleats on the outsole for greater traction in all terrains. Innovative High Pressure Compression Moulded outsole skin technology delivers unparalleled physical toughness in high tear, abrasion and tensile performance. Improved footbed moulds to the foot shape with improved thermal properties. Redback's exclusive Full Grain Tannage, delivers leathers which are 2.5 to 2.7 thick, a huge 30% increase in substance than normal work boots. Sizes 2 - 13UK (4.5 - 11.5). The Size On Redback Boots is a UK/AUS Men's Size. PLEASE SEE THE REDBACK SIZE COMPARISON CHART BELOW. 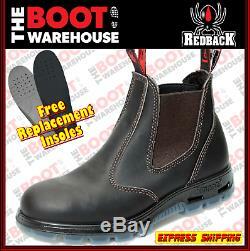 The Boot Warehouse is an authorised distributor of Redback Boots. Australia Post have a Web Site you can visit which details whether your location falls into their Overnight Network. At The Boot Warehouse, we pride ourselves on being an'Express Shipper! All Boot & Shoe Deliveries Are Free. All Orders Are Sent Via Australia Post eParcel. All Orders Are Posted Within 24 Hours (with the exception of Pe-Order styles). Footwear Is Sent In Original Boxes. Customer queries or problems are handled within 24 hours. Orders sent via Free Regular Post. That's right, The Boot Warehouse offers full transit cover on your item. While it does not happen frequently, if your parcel is lost in transit, and is unable to be located by Australia Post we firstly need to lodge an investigation with Australia post so they can check with the last employees who handled your parcel, please know this can take around 5 days to receive an answer, If they are unable to provide us any information on the location of your parcel we will post another order to you ASAP, at no additional charge. Orders are sent via International Express Australia Post service - tracking to your door. General transit time is 4-10 days. All international orders are also covered with full transit cover. While it does not happen frequently, if a parcel is lost in transit, please allow an additional 7 days while an investigation is logged with Australia post. If the investigation is unsuccessful a replacement item will be dispatched to you free of charge. How please be aware that we cannot accept footwear back which has been worn and/or shows signs of wear. You are welcome of course, to try your new footwear on in your home. But please do so on a carpeted area. And do not wear them outside until you have decided to keep them. But what we can do is offer you our great Australia post rates! Changed your mind and no longer require the boots? We are happy to take them back. We will send you a link to an Online Return Form, plus all the other details you need to get your boots back to us. Please wrap your box in newspaper or pop it into a bag, please make sure you do this as we intend on reselling your product. The return cost of your new pair will be the same amount as you were charged for your original order. If you would like to be reminded of this price, please ask us prior to sending your return back. Please view the Size Chart for the Brand of boots you are purchasing in the Listing Images, or under the Size Chart Tab in the Item Description page. All Of The Footwear We Sell Is (Australian) UK/AU Sizing. Which Is The Same As UK Sizing. So, for example if you know your Men's US Size, compare it to the UK/AU Size in the Chart. And that's the size you order. Please know that the size chart supplied is to help you confirm your size. The Boot Warehouse cannot be held responsible for incorrect size selection. If you know your size in either UK, US, EU or (Australian) AUS/UK Sizing, then you should have no problems ordering your correct size. If you are unsure of the Size you normally wear in any of those'Sizing Types', then measuring your feet length will provide a guide as to what size footwear you need to order. Following the simple guide below, measure'both feet'. You will most likely find one foot is slightly longer than the other, which is quite normal. Then find your boot size on the Oliver Size Chart by comparing your foot measurement. So using this information is not foolproof and should be used as a guide only. You'll Need A Large Piece Of Paper. Stand With Your Heel Against A Flat Wall. Mark The Longest Distance From Your Heel To The Tip Of Your Toe. Always do both feet as quite often one foot is slightly longer than the other. Always measure with socks or stockings on if shoes or boots. Are to be worn with them. If the measuring result you get is'in between' - go up a size. We will be able to provide more information and advise you of alternatives. If you still get it wrong, don't worry. However a few extra minutes spent checking now and then double checking! FINALLY, SOMETHING YOU SHOULD KNOW ABOUT HALF SIZES. All Australian Boot Manufacturers produce their'half size' boots at exactly the same length as the preceding'full size'. As an example, a Size 9.5 boot is the same size in length as a Size 9 boot - The difference is in the girth (the width across the forefoot), which in the half sizes, is manufactured several mm wider than the preceding full size. So the half sizes'feel' bigger, and are recommended for people with wider feet. AfterPay is available on our website. Pay for your order over 4 fortnightly instalments interest free! Mon - Fri 9-5 Sat 9:30-1pm. Join us to receive updates and great offers. The item "Redback USBOK Work Boots. NEW" is in sale since Wednesday, June 19, 2013. This item is in the category "Clothing, Shoes, Accessories\Men's Shoes\Boots". The seller is "thebootwarehouse" and is located in Miranda, NSW. This item can be shipped to Australia, all countries in Europe, all countries in continental Asia, United States, Canada, New Zealand.